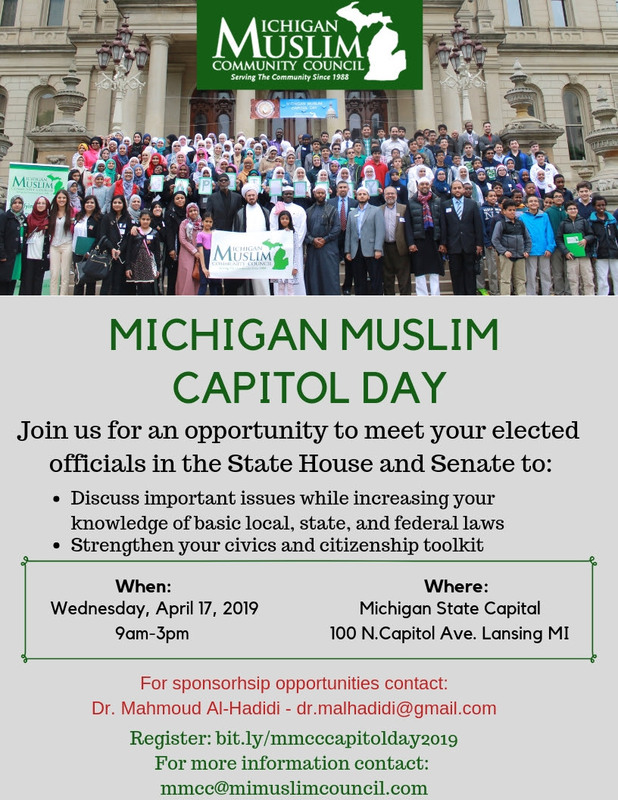 MMCC’s 2019 Michigan Muslim Capitol Day is Fast Approaching! Every year, the Michigan State Capitol welcomes over 115,000 people including school children, families, and community groups to tour with a guide or independently. While at the Capitol, visitors have the opportunity to watch the legislatures meet for a session, learn about Michigan’s government, and tour the Capitol building. Capitol Day is observed and celebrated by many diverse ethnic and heritage communities, locally and nationally. The Michigan Muslim Community Council (MMCC) Capitol Day is a non-partisan annual signature event. MMCC Capitol Day is scheduled for Wednesday, April 17th, 2019 from 9AM-3PM at the Michigan State Capitol – 100 N. Capitol Ave. Lansing, MI. The event attracts more than 500 American Muslim Michiganders, youth and adults, from diverse backgrounds of both the Western and Eastern Districts of the State of Michigan. It is an opportunity to meet your elected officials in the State House and Senate to discuss important issues while increasing your knowledge of basic local, state, and federal laws. Your participation will provide you a unique opportunity to outreach, interact, and engage with hundreds of American Muslims and allies onsite, along with millions virtually via the MMCC statewide digital footprint. Training and workshops on strengthening your civic, citizenship, policy, social justice, diversity and inclusion, anti-bullying programs and many more professional development activities that are aimed to increase your toolkit will be offered. State Continuing Education Clock Hours (SCECHs) are pending for review, we are confident the request will be approved. School administrators and educators will be eligible to obtain and use SCECHs toward certificate/licensure renewal. The Governor of the State of Michigan, Gretchen Whitmer, will deliver the grand keynote speech. Attorney General, Dana Nessel, will deliver the keynote speech and the Michigan Supreme Court Justice, Justice Richard Bernstein, will deliver a co-keynote speech. State Representatives, both Republicans and Democrats, across the state will also address the audience. We have several universities, colleges, public and private schools, along with organizations and corporations confirmed to sponsor and participate in this year’s event. MMCC donated $100,000 to help Detroit residents pay their water utility bills. Earlier this year, MMCC led a crowdfunding campaign to serve thousands of federal employees and their families dinner during the government shutdown statewide and distributed thousands of gas and grocery gift cards. MMCC raised over $50,000 for Flint residents in need of clean water. We invite you to join us as a sponsor and/or participant to celebrate Capitol Day. Join us to learn about our constitution through activities, exhibits, and demonstrations of the love for our country, state, freedoms bestowed from our founding fathers. Please see the sponsorship opportunities below. Feel free to contact MMCC Chairman, Dr. Mahmoud Al-hadidi, for any questions at dr.malhadidi@gmail.com. Stay informed and stay tuned.